When we are on our computers, we want to be able to get to where we are going as quickly as possible. This means utilizing links, shortcuts and jumplists. If you are using Windows 7 and do not use the jumplists, you are missing out on an essential feature added to the operating system in its current state. Jumplists allow you to revisit documents, website links and more associated with when you last used a particular program. 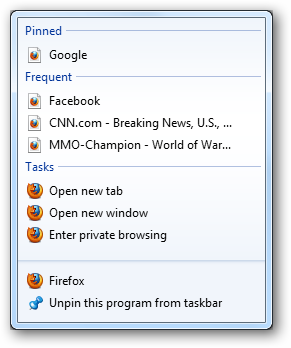 Items that are pinned to the taskbar can also utilize jumplists for easy navigating in Windows 7. If you are not sure about where you jumplists are, the quickest way to see one is to open your “Start Menu.” You want to hover over any pinned items there that have an arrow next to them. The arrow indicates a jumplist is associated with that program. 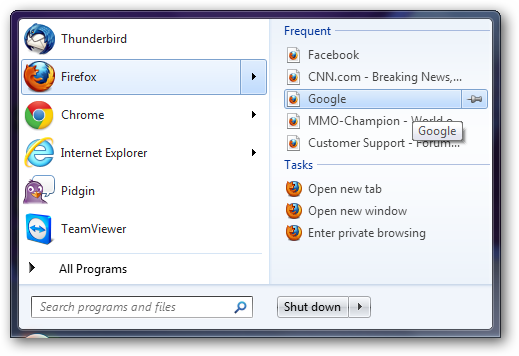 When I hover over the Firefox link in my own Start Menu, it opens its jumplist. 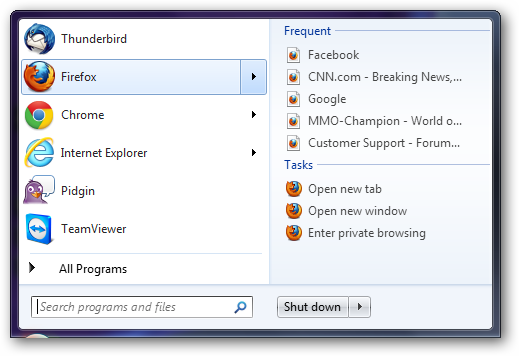 The jumplist contains some of the web sites I have visited recently along with some options for using Firefox, such as opening a private browsing session. If I click on that link, it will open Firefox in its private browsing mode for me. 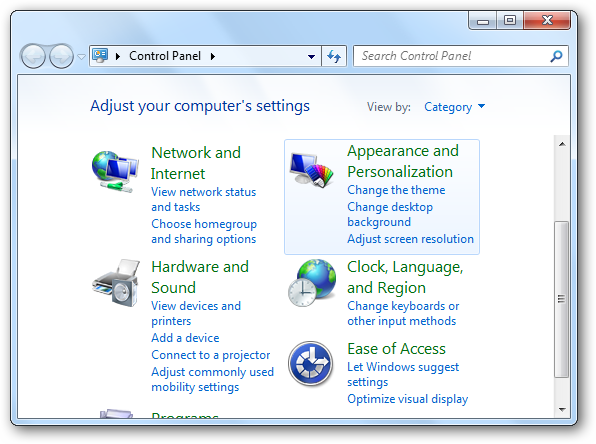 There are a variety of sections to a single jumplist in Windows 7. 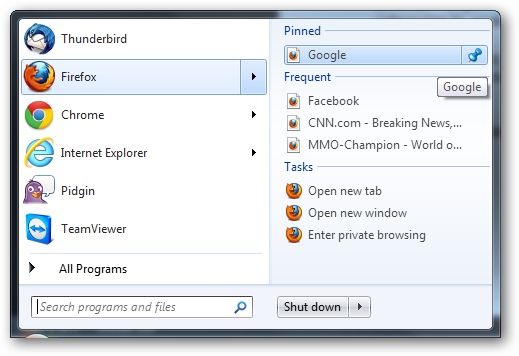 For Mozilla Firefox you have: Pinned, Frequent and Tasks. Tasks are assigned to the jumplist by the program itself and these cannot be changed. Frequent are documents, multimedia or web sites you visit; this will depend on the type of program and what you use it for. In this case, Firefox has some of the last web sites I visited in my last session with the browser. Depending on the program using jumplists, you may see different types of categories to work with. Pinned items to a jumplist are ones you add to it yourself. You can pin an item to any jumplist as long as it is already displayed in it. You simply click the “push pin” next to the item. If you want to unpin an item on the Start Menu jumplist, you click the blue “push pin” next to an item you pinned. 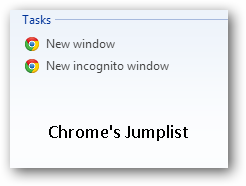 Jumplists can also be used from the Windows 7 taskbar. If you have pinned any programs or folders to the taskbar, they might have a jumplist associated with them. In order to discover if they do, you want to right-click on the program or folder in question. Now, click the “Appearance and Personalization” link. 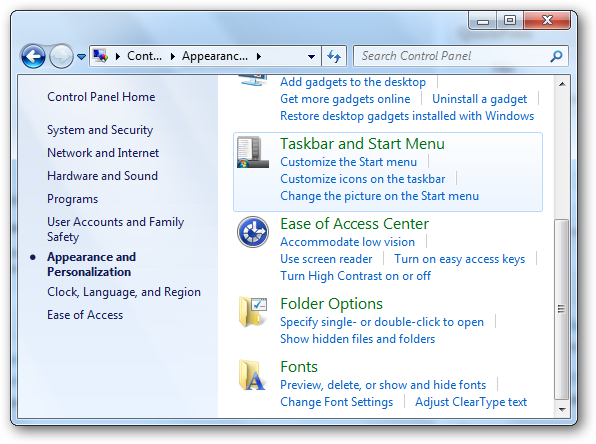 Once here, you want to click on the “Taskbar and Start Menu” link. If you do not want to go the roundabout way to get to the properties for the Start Menu and Taskbar, you can right-click the “Start Menu” icon. 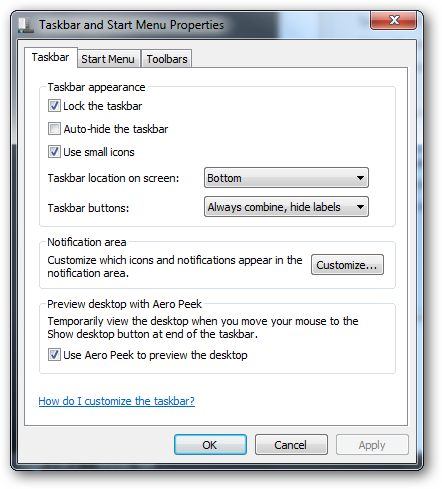 This will open all the options you have for dealing with your Start Menu and Taskbar. You want to click on the “Start Menu” tab. 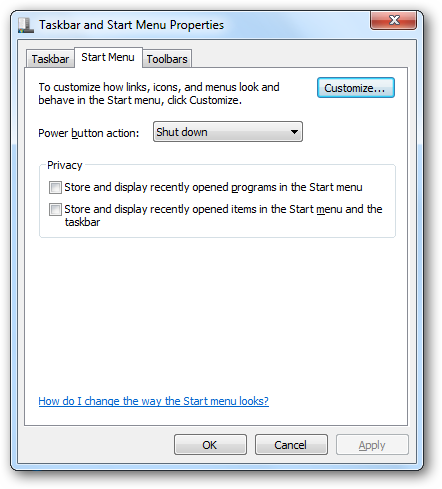 In order to clear the history from your jumplists, you want to uncheck the boxes next to “Store and display recently opened programs in Start menu” and “Store and display recently opened items in Start menu and the taskbar.” Next, click “Apply” to save these changes. You can then click “Ok” to exit the menu. If you open your “Start Menu” again and navigate to one of your jumplists, you will see that the recently visited topics or whatever you program calls it are gone. 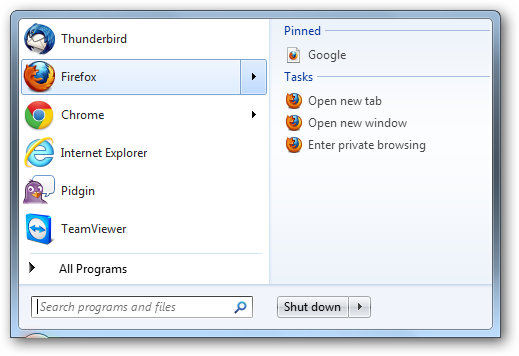 It will take some time to get used to jumplists and their features, because every program that utilizes them in Windows 7 has a different layout. The quickest way to learn about jumplists is to begin using them. Open your Start Menu right now and look to see which programs there have jumplists attached to them. Check out each one and see how they make using that program more effective for you. 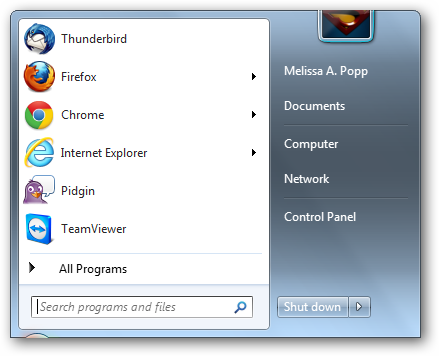 Windows 7 jumplists make it easier to get to where you want to go with the programs you use the most frequently. The quickest way to figure out how jumplists will work for you is to begin using them. Once you get the hang of using them, you will find that they make getting to your favorite web sites, opening your most used documents and finding a way to your multimedia much easier than before. When we normally need to find something in Windows 7, we either open a folder or program and begin hunting for what we need. With jumplists, we can pin these items for easy access making it that much quicker before we are where we need to be. It may seem to some users that jumplists do not offer a great deal of customization and functionality that they may like when using programs this way. There are a few programs out there that make managing jumplists easier and give the user more power over what they do. Stay tuned to TechNorms for upcoming posts on Windows 7 jumplist customization tools.